Danny Ward sent Huddersfield into the Premier League with back-to-back shootout wins and he was at it again for Leicester on Tuesday night. Deputising for Kasper Schmeichel, the £12million summer signing from Liverpool made three superb penalty saves to knock out Wolves and take Leicester into the Carabao Cup fourth round. Ward, the Wales international, pushed away spot-kicks from Romain Saiss, Diogo Jota and, spectacularly, Adama Troare to enable Kelechi Iheanacho to convert the winning penalty. It was all that Leicester deserved for a display that gave Molineux the rare sight of Wolves chasing the ball. 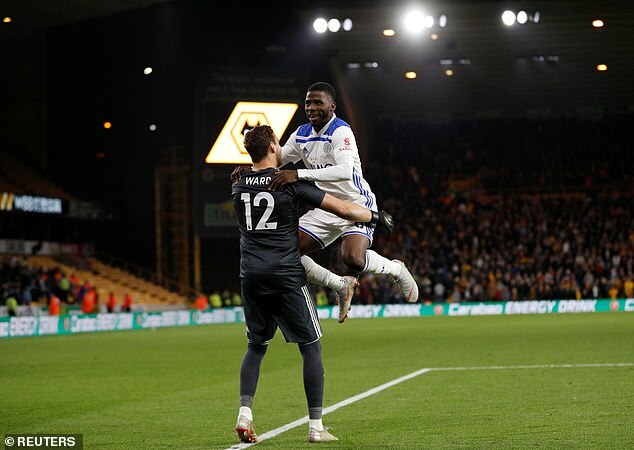 Wolves have taken brilliantly to the Premier League but Leicester’s strength in depth extends further and the visitors dominated large periods. It was nine changes for Wolves and eight for Leicester, but six Premier League champions started the game for Claude Puel’s side. Vicente Iborra twice went close to scoring inside six minutes, first scorching a low shot narrowly wide and then putting a header over when found by Rachid Ghezzal’s free-kick. A neat Leicester move involving Marc Albrighton, Jamie Vardy and Ghezzal ended with Adrien Siva teed up on the edge of the box but his goalbound strike hit Romain Saiss flush in the stomach. It was a surprise to see Vardy starting his first League Cup tie in more than five years but then again he missed three games through suspension earlier this season and no longer has England concerns. He brings the devil with him whatever the contest too, as Kortney Hause discovered after muscling Vardy off the ball. Vardy went all Sergio Ramos and flung Hause to the turf by the arm. Upon rising Hause refused Vardy’s handshake and was not impressed by referee Paul Tierney’s attempts at mediation. Wolves finally got going when a lucky ricochet freed Traore. His cross was headed back by Ivan Cavaleiro and Jonny Otto struck over. Soon after Ruben Vinagre burst down the left flank and hit a finish that Ward needed to tip over. At the other end Conor Coady was well-placed to clear off the line when Ghezzal beat John Ruddy with a volley from Albrighton’s deep cross. Ruddy then punched away an Albrighton piledriver. After the break Ruddy tipped wide a swerving shot from distance by Ricardo Perreira. And the Wolves goalkeeper produced an even better save when Ghezzal’s cross found Albrighton just six yards out. The finish was firm but Ruddy met it with a strong palm. Wolves relied primarily on counter attacks and one in the 72nd minute really ought to have seen them take the lead. Leading a four-on-two break Traore played in Morgan Gibbs-White but his finish was too close to Ward, who blocked. In added time Gibbs-White sent a free-kick deep to meet the run of Ryan Bennett but the defender’s header went over. In the closing stages Demarai Gray sustained what looked a serious injury. The Leicester winger challenged for the ball with Bennett but fell awkwardly and immediately signalled for medical assistance. He received oxygen, his left leg was strapped up, and he was stretchered off the pitch. His teammates finished the job, although Christian Fuchs and Hamza Choudhury missed for Leicester in the shootout. Ghezzal and Iborra scored alongside Iheancho, meaning Ward’s heroics were worthwhile.